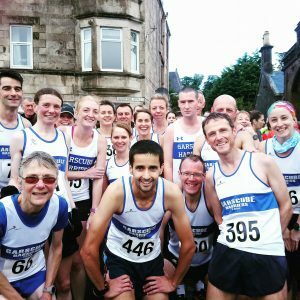 It was the annual Garscube trip ‘Doon Watter’ this weekend for Event 10 of our Summer League – the Around Cumbrae 10 Mile Road Race. Conditions were testing with a tough headwind on the second half of the race, and some heavy Scottish rain thrown in. However, Club Secretary, Stuart Irvine tells us it was quite benign compared to previous years where runners had to avoid the waves crashing onto the road! Katie White retained her title from last year finishing 1st Lady in 60:36. Her mum, Ann White was also 1st FV60 in 76:14, and there was another category prize for David Lindsay was 2nd MV40 in 58:09. We are awaiting confirmation, but it looks like our Ladies Team may have also won 1st Team with Katie White, Charlotte Wilson and Anne Sillars. Well done to everyone who took part. Our Summer League will be updated soon, so please let Morag Casey know if you got a PB to be awarded extra points!